In a parallel-existing America, but one sounding uncomfortably plausible, hippopotami have been imported to Louisiana and bred on bayou ranches to fill the US’s “meat crisis.” One such rancher, Winslow Remington Houndstooth, Blackpool boy turned breeder, owns the best ranch until he has the misfortune to see it burned by an unknown hand and all his hippos, with the exception of newborn Ruby, killed. Eventually, the other ranches fail and the remaining hippos turn feral and man-eating. On the Mississippi, a dam is built—the Gate—keeping the creatures from travelling overland to other waters. Currently, the government wants to rid itself of the animals and open the river, establishing trade routes up and down the Mississippi. Unfortunately, an opportunist named Travers blocks this endeavor. When the Great Hippo Bust of ’59 rendered half of Louisiana worthless, Travers bought as much land as possible, reselling it to the Bureau of Land Management with one stipulation: that he have exclusive business rights to the water and the right to deny access to anyone seeking entry. Travers and his riverboats own the Harriet, that portion of the Mississippi. Winslow Houndstooth and his group have been hired to go in, open the dam, and drive the feral animals into the Gulf. Houndstooth’s doing it for two reasons: the money, naturally, and revenge. Going along with Houndstooth are a motley crew: Cal Hotchkiss, the most dangerous gun alive and a compulsive gambler, a man who’d as soon shoot Houndstooth as look at him, and vice versa, since he was the one setting torch to Winslow’s property; Regina Archimbault, con woman par excellence—“no one ever suspects the fat lady”; Adelia Reyes—Cal’s lover—tattooed, dangerous, and seven months pregnant; and Hero Shackleby, a demolition expert, fluid of gender and always speaking of themself in the third person singular. Mounted on their various hippos, this hardly magnificent five dares invade Travers’ kingdom, a place where sudden death at the teeth of feral hippos is the norm, enemies fight side-by-side one minute and try to kill each other the next, and love occasionally finds its way into the most hardened of hearts . . .
People die and mourning last a moment. Life, revenge, and the government’s mission takes precedence. And then there are the hippos, themselves: the saddle mounts, as faithful to their riders as hounds, and the wild ones. And the question remains: Which is more bloodthirsty, a feral river horse or Travers? What will each do when the Gate is breached and the dammed water, freed by Hero’s dynamite charges, flows into the Gulf taking the hippos with it? Some online research assures this little known episode of American history actually happened, instigated by adventurers Frederick Russell Burnham and Fritz Duquesne, and aided and abetted by Louisiana Congressman Robert Broussard. If the plan had succeeded, perhaps this adventure might’ve become a reality. Whatever the case, this alternate history is entertaining, if somewhat disturbing, a kind of Magnificent Seven meets Indiana Jones on the Mississippi. Indeed, it has that slightly irreverent, blackly humorous air familiar from a good many of today’s so-called action films. It’s a preposterous, fun, but perilous escapade. 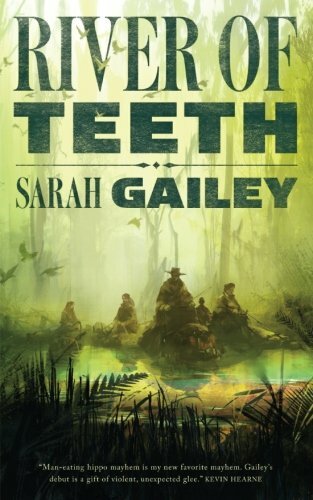 Written in an easy-to-read narrative, with a slight stream-of-consciousness air, Gailey’s characters are uniquely penned, each one possessing heroic but at the same time antagonistic attributes. Sometimes devil-may-care, occasionally tender-hearted, always deadly determined, they’re all distinctively individual. While River of Teeth’s ending is somewhat abrupt, leaving many questions in its wake, the fact that this is designated as Book 1, justifies its sudden finish. It does, however, engender the wish that the novella had been lengthened into a novel with a better conclusion. Here’s hoping Book 2 and any others come soon enough, for that little cliffhanger definitely whets the appetite. The reader will be left wanting to learn the fate of Houndstooth and his companions and discover more of this Western-on-the-Mississippi.